I don’t know about you, but I find any trip to The Cheesecake Factory to be completely and utterly overwhelming. Their food is delicious, but the length of their menu never ceases to both amaze and befuddle me. 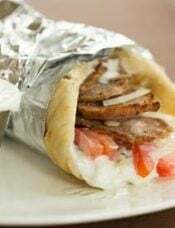 Even though I’ve eaten there countless times, I always spend copious amounts of time poring over each and every item while my stomach grumbles, begging me to make a quick decision. (Have I mentioned how indecisive I can be at times? It’s awful!) The real test comes after the meal, when you’re confronted with the cheesecake menu. I should make it my business to try each and every piece on that list. Not a bad hobby, right? For a long time Oreo reigned supreme for me, then I tried some different varieties which I wasn’t too fond of, and now the Snickers cheesecake is my current favorite. 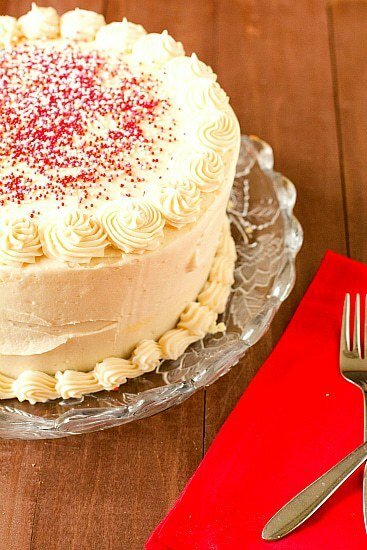 My Chief Culinary Consultant has an old standby favorite as well – the red velvet cheesecake. 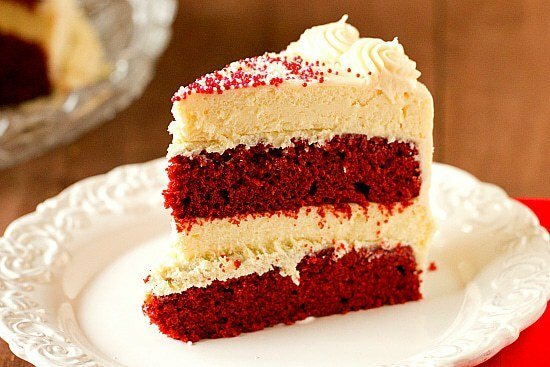 It is a four-layered dessert, with two layers each of red velvet cake and creamy cheesecake, all covered in cream cheese icing. It’s decadent, drool-worthy, and delicious. And I was totally determined to recreate that baby at home. What better time than in preparation for Valentine’s Day? Now on to the cheesecake… this really isn’t terribly difficult, just a little time consuming. It helps to spread the work out over a couple of days, and then it’s easy breezy. I started with a very basic cheesecake recipe (no crust) – baked that and got it into the fridge. Then I went ahead and doubled the recipe for my Red Velvet Cupcakes and used the batter to make two 9-inch cake rounds. 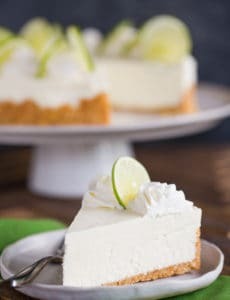 To assemble, you’ll need to slice the cheesecake in half horizontally to create two layers, which you can do with a very sturdy hand and long serrated knife, or you can use a cake leveler (they’re super cheap and so easy to use – great for evening off any domed tops of cakes too). 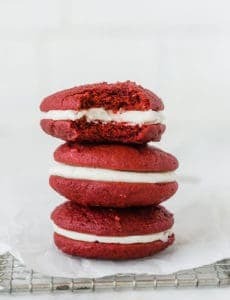 Then stack the four layers on top of one another, alternating red velvet cake and cheesecake, and then frost the whole thing with cream cheese icing. Absolutely divine! Do you have a favorite type of cheesecake? Make the Cheesecake: Preheat oven to 350 degrees F. Butter a 9-inch springform pan and then tightly wrap the outside with heavy duty foil. (I find that double-wrapping helps prevent leaks in a water bath.) Put a pot of water (or a tea kettle) on to boil. Using an electric mixer, beat together the cream cheese and sugar at medium speed until completely smooth, about 3 minutes. Add the eggs one at a time, beating for a minute or so after each addition, and scraping down the sides of the bowl as needed. Add the heavy cream and vanilla extract, and beat until completely incorporated. Pour the batter into the springform pan; place the springform pan into a larger pan, such as a roasting pan, and pour the boiling water into the larger pan until the water comes about halfway up the side of the springform pan. Bake until the cheesecake edges are set but the middle still jiggles a bit, about 45 to 55 minutes. Turn the oven off, but leave the cheesecake in the oven with the door closed for 1 hour. At this point, remove the cheesecake from the water bath and place the springform pan on a cooling rack to cool to room temperature. Place the cheesecake in the refrigerator until well-chilled, at least 4 hours or overnight. 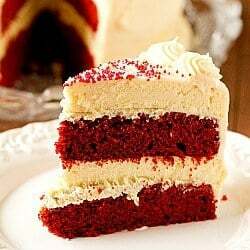 Make the Red Velvet Cake: Preheat oven to 350 degrees F. Grease two 9-inch cake pans. Line the bottoms of the pans with a parchment round, butter the parchment paper, and then flour the pans. On medium-high speed, cream the butter and sugar until light and fluffy, about 3 minutes. Turn the mixer to high and add the eggs one at a time, mixing for about a minute after each addition. Scrape down the bowl and beat until well incorporated. Reduce the mixer speed to low and slowly add half of the buttermilk. Add half of the flour and mix until combined. Scrape the bowl and repeat the process with the remaining buttermilk and flour. Beat on high until smooth. 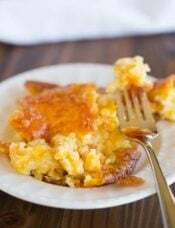 Divide the batter evenly between the two cake pans and bake for about 30 minutes, or until a thin knife or skewer inserted into the center comes out clean. Cool for 10 minutes and then remove cakes from the pans and place them on a cooling rack to cool completely. Make the Frosting: Using an electric mixer with the whisk attachment, whip the butter and cream cheese on high speed for about 5 minutes, scraping down the bowl as necessary. Reduce the speed to low and slowly add the powdered sugar until all is incorporated. Add the vanilla and mix to combine. Increase the speed to medium-high and whip for a few minutes until the frosting is light and fluffy, scraping the bowl as necessary. Assemble the Cheesecake: If needed, level the tops of the red velvet cake layers with a serrated knife or cake leveler so that the tops are level and not domed. Next, slice the cheesecake in half horizontally to create two layers. 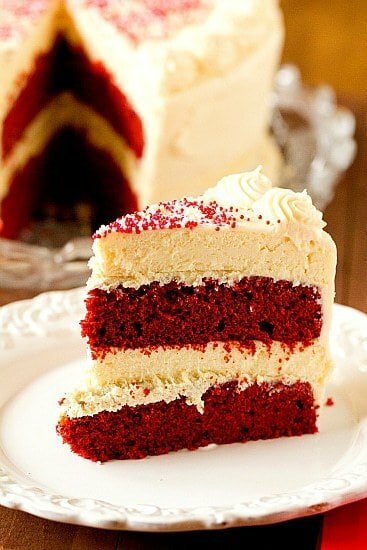 Place one layer of the red velvet cake on your serving plate. Spread a very thin layer of the cream cheese frosting over it (it creates a type of glue so that the layers stick together and don't slide around). Top that with one layer of the cheesecake, and again top with a very thin layer of frosting. Repeat, adding the second red velvet layer, and then placing the second cheesecake layer on top, with a layer of frosting between them. Using the remaining frosting, cover the cake in frosting and decorate as desired. 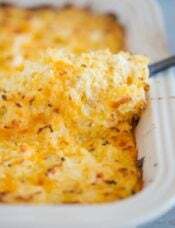 Refrigerate until ready to serve, and refrigerate any leftovers. This looks super divine! I was planning to make individual servings. 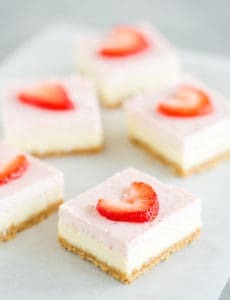 Any recommendations how that will work if I use a cupcake tin/ silicone for the cheesecake? What will be the baking timings? Hi Sana, It really depends on the size of the silicone or cupcake pan you’re using; I would probably start checking around 15 or 20 minutes depending on the size. How do you cut the cheese cake horizontally . This is simply the best cake I have ever made. I make this for my friends special occasions and they RAVE about it until I make the next one. 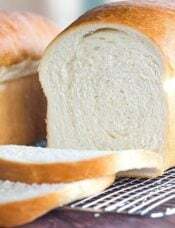 Thank You for the recipe . I have now made this cake twice in the last week! The first time was for coworkers, who gave it rave reviews, but let’s be honest, pretty much anything red velvet with cream cheese can show up on a Tuesday and everybody is going to be happy about it. The second time was for my best friend’s birthday. The Cheesecake Factory red velvet cheesecake is her favorite, when she was on weight watchers it was the one thing she’d guiltlessly splurge on, and she often keeps a slice in the freezer for special occasions. She has had many of my baked goods over the years, and always ranks them in order of her favorites. The BEB Irish cream cupcakes have been unbeatable at the top of her list for years, until now. This cake is incredible. The first time around I had a few issues, mainly I didn’t quite butter my springform pan well enough and slightly overcooked the cheesecake so it split in the middle. I also couldn’t figure out how to get it to come away from the bottom of the pan, so I had to piece parts of the cheesecake back together on top. It was fine though, frosting covers all sins. The second time I used my cake leveler to both cut the cheesecake in half, and also to cut the bottom layer of cheesecake off the pan, which left me with perfectly even lines. It’s actually helpful for it to stick to the pan, because that allowed me to lay the bottom layer of red velvet with a thin layer of icing upside down on top of the cheesecake, then flip the whole thing out onto the cake platter. I then lifted up the bottom of the cheesecake pan, with the other half of the cheesecake still attached, didn’t need a huge spatula to split it, and everything came apart cleanly. I dropped the next red velvet layer on top of that (with the frosting in between layers), then inverted the cheesecake again on top and used the leveler to cut just underneath the pan to pull it away. The cake is a lot of work, so I don’t think I’ll be doing it twice in one week again, but it is incredibly delicious. Breaking it down over a couple of days is a must, so that the Cheesecake can fully cool in the fridge, but it also makes it slightly less upfront work for the baker. 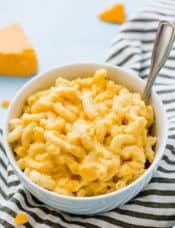 im planning on making this recipe next month for a friend! im curious if you have made it into a blue velvet cheesecake?! or if you have any tips for getting the blue velvet to a nice color without it tasting like blue dye… thank you so much! Hi Liz, I’ve never made blue velvet, unfortunately! This sounds killer good and this gives me an idea for a gluten-free version.
. Only catch is, one has to use an accurate digital thermometer, in order to figure out what temperature setting gives a 2oo°F oven. It takes about half a day to do this being sure to place a metal pan with an equal amount of tepid, not cold, water in it to simulate a springform pan full of cheesecake mix. Once that’s done, just preheat the oven for an hour prior to baking to ensure a stabilized oven. Hi Janis, Yes, that would be fine. 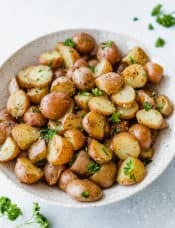 I saw this on Pinterest and it looks very good. I am interested in trying this out for my upcoming birthday however, with my work schedule I doubt I would have time to do so. At least from scratch. How do you think it would turn out by using a no-bake cheesecake and boxed cake mix? Hi Sherrell, Yes, I think that would still work out just fine! Enjoy! Okay, great! I’m looking forward to trying it out. Thank you!